Description: 7PRO - 7.0" Super-bright LCD fishfinder with dual-channel CHIRP DownVision™ sonar and chartplotter. No charts included. Description: 7PRO - 7.0" Super-bright LCD fishfinder with dual-channel CHIRP DownVision™ sonar and chartplotter. C-MAP Rest of World charts. Description: 7PRO - 7.0" Super-bright LCD fishfinder with dual-channel CHIRP DownVision™ sonar and chartplotter. C-MAP US Essentials Charts. Description: 5PRO - 5.0" Super-bright LCD fishfinder with dual-channel CHIRP DownVision™ sonar and chartplotter. Navionics+ North America Gold Charts. See the real world below with the Dragonfly 7PRO. 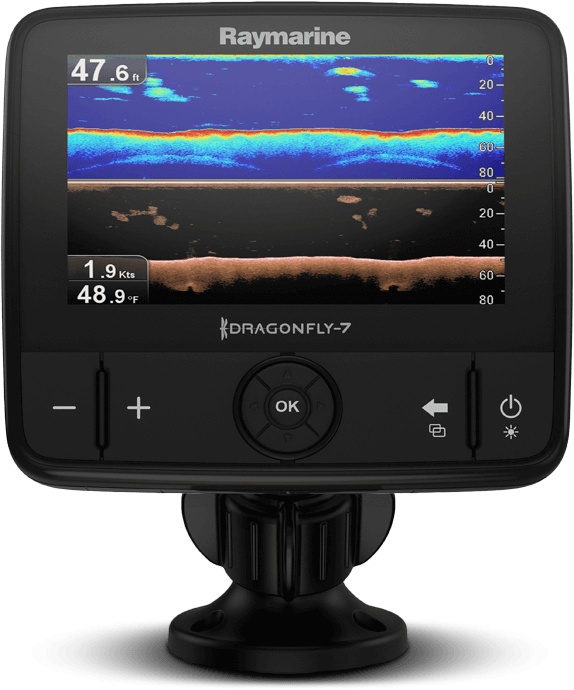 Our most affordable Dragonfly display; the Dragonfly 7PRO with dual-channel CHIRP DownVision and Fish-Targeting Sonar, bring serious sonar technology in reach of every angler.